I washed my hair with My Honey Child's Sweet Citrus Scalp Cleanser and it is magnificent. Like all the other MHC scalp cleansers and exfoliators my hair is soft clean and it smells oh so good. It's always a good sign when I can't stop touching my hair. Yes, I would buy this cleanser again. Since it is a MHC product, it has great ingredients and it is paraben free. It costs $10.00, you can find the ingredients below. Ingredients:Raw Honey, Chamomile Extract, Coconut Soap Base, Sweet Orange Essential Oil, Lime Essential Oil, Grapefruit Essential Oil, And Purified Water. 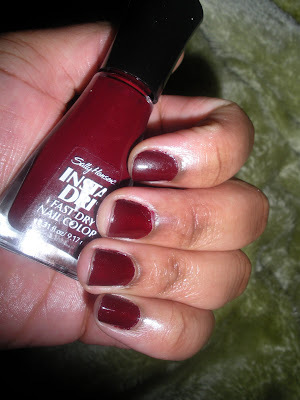 This is another color from the Sally Hansen Insta-Dri collection. The color is #18 Cinna-Snap. This polish dries in 60 seconds. Monday is my last day of the detox section of Dr. Ian Smith's fat smash diet. I think I will still keep meat at bay for a few days longer, let's see how it goes. In the current issue of Heart and Soul Magazine an article discussed a recent study that showed those who get less than 5 hours of sleep each night had plaque buildup in their hearts while those who slept longer did not. Although the age group tested was an older population it is still a good idea to start out early getting enough winks each night. I know I certainly went to bed earlier last night. Are you watching the #1 ladies Detective Agency starring Jill Scott? I like the series and I will be tuning in each Sunday on HBO at 8:00. 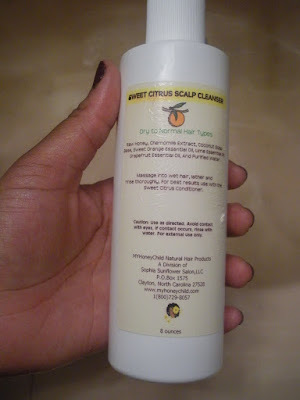 The Swee Citrus Scalp Cleanser sounds nice - I like the idea of honey and lime. I like that nail polish color! And yes, I'm watching Jilly on HBO. I ordered HBO just for her. And when the series is over, I'm taking HBO off....my cheap behind. LOL! Happy monday! Laquita I really do like the MHC hair products they seem to work really well with my hair. Yes and really enjoy the acting of the #1LDA. B-thanks LOL @ getting hbo cut off when the show is done.